Navratri starts tomorrow and sundal is one of the main neivedhyam (offering) prepared during this festival. 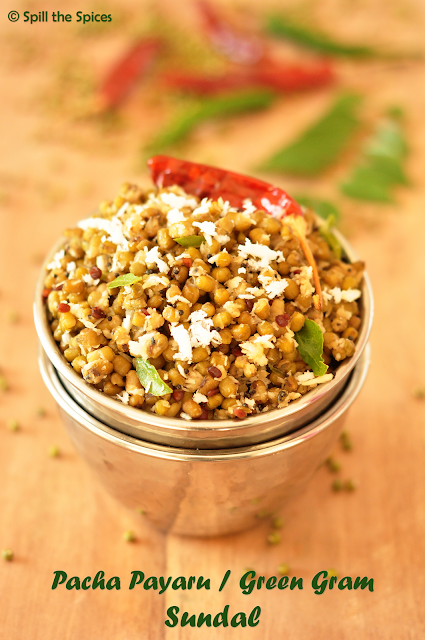 Sundal is like a no onion-no garlic snack made with different legumes, beans or lentils with freshly grated coconut and simple tempering of mustard seeds, urad dal, red chillies and curry leaves. Sundal is protein packed, so you can make it anytime as a healthy snack. I have already posted few sweet and savoury sundal recipes in the blog. Today I'm posting a simple sundal wih green gram/pacha payaru which requires no soaking. If you have time, you can soak it to reduce cooking time. But if you are pressed for time, you can make this in less time without worrying about pre-soaking, as most legumes and beans require. I have posted the sweet version of this - you can check out the pacha payaru sweet sundal recipe here. Let's see how to make this easy sundal. 1. Pressure cook the green gram for 3 whistles adding water just enough to cover it. 2. Heat a small pan and add oil. Then add mustard seeds, urad dal, red chilly, asafoetida, green chilly and curry leaves. 3. Add the cooked green gram, coconut, salt and gently combine everything. The green gram should not be over cooked and turn mushy. You can add lemon juice at the end.